With the recent v0.0.8.1 Master Core tag (build instructions, source and binary), we’re now way ahead of the game. The Mastercoin Foundation is happy to announce the following major enhancements in the most recent build of Master Core, released yesterday: Secure Asset Issuances and Sends, Smart Property Adminstration and Pre-funded Simple Sends. All live on Bitcoin mainnet. As more and more companies and projects are considering crypto-asset issuances, we’ve worked to anticipate their needs and demands by adding security and management capability to assets created on the Master Protocol. Serious issuers need serious control, and the community that accepts and uses these assets must know what the issuers can and will be able to do with their assets. These new features not only build trust between issuers and users, but also provide a robust toolset that asset-backed issuers can leverage and rely upon for the security and flexibility of their assets. Using P2SH Multisig, Smart Property Asset Issuers can require multiple parties (M-of-N) to approve issuances and grants. This provides protection from a single compromised private key being abused, and will give users more comfort that asset issuers will maintain control of their asset. Multisig addresses are also now supported for receiving tokens, and conducting secure M-of-N sends to other recipients on the Bitcoin blockchain. On-demand grants and revokes of user-defined assets, allowing asset-backed tokens to regulate the number of tokens in circulation against their reserves of assets. Asset ownership transfer (issuance rights, grant rights) allows the issuer to transfer their issuance and grant rights to another Bitcoin address (regular or multisig). On testnet, we also have provided Send-to-Owners functionality, which allows an issuer to send a proportional amount of tokens to the holders of that token in a single transaction, based on the amount the holders have in their wallets at the time of transaction. This allows for distribution of tokens on a proportional basis with a single Master Protocol transaction (and therefore a single Bitcoin miners fee, no matter the number of holders). Since all Bitcoin blockchain-based assets require some amount of BTC to be used on the network, we’ve added an optional attribute to Simple Sends to allow the sender to provide additional BTC to the recipient (so that the recipient can have BTC funds available for additional sends and other transactions). While we won’t be distributing binaries of the Master Core user interface until next week, extremely aggressive and non-risk-averse testers are welcome to compile from source against the 0.0.8.1 build and play with the user interface in its current state. Some other noteworthy additions to the 0.0.8.1 tag are better unconfirmed transaction support and better blockchain reorganization protection, not to mention additional RPC calls for retrieving information about transactions related to crowdsales and DEx purchases. 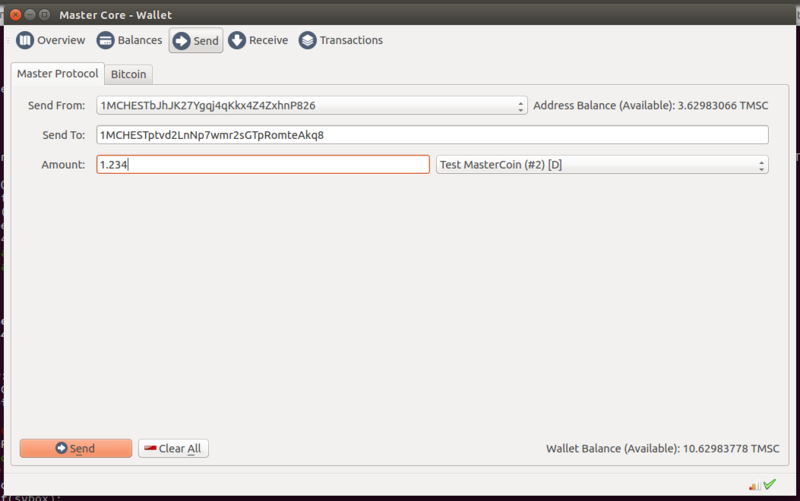 Omniwallet has also moved to the most recent tag and supports the new features. Work began this week on a re-base to Bitcoin Core 0.9.3, which is going much smoother than one would anticipate from an important update in the Bitcoin reference client. 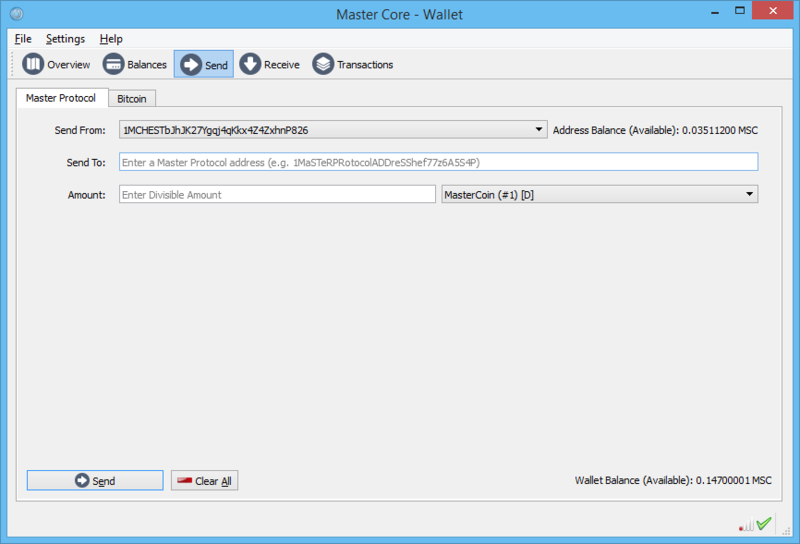 Master Core tag 0.0.9 will be based on Bitcoin Core 0.9.3 (Master Core 0.0.8.1 is based on Bitcoin Core 0.9.2). Next up are two major features that have been in high demand: MetaDEX (the meta-token decentralized exchange for all Master Protocol tokens) and Savings Addresses. As these get closer, we’ll have testnet RPCs and UIs to play with. The pace is blistering over here in the blockchain – so many devs and so much code all building towards the most robust financial, contract and business logic platform on the Bitcoin blockchain. Each day we add another group of integrators and innovators to the platform, and there are some major announcements in the wings. If you have any questions, ask me anything. If you want to get involved, now’s the time – if you’ve been interested in developing an innovative new technology, or issuing your own smart property asset, the Master Protocol provides the tools you’re looking to leverage, and more is on the way. If there are features you want to see, write ‘em up, send ‘em our way, or make a pull request against the Master Protocol Spec and we’ll get it into the queue. Lots more coming, and community feedback is the driver! Great to learn about all this. Way to go Craig. Please keep up the good work. Three cheers. Very good.. but do make a habit of pointing directly to build instructions, not just source. That’ll help people take a leap and try it. A good habit, indeed. Post updated. Thanks!